Mike Lull Bass at Bass Club Chicago, since 2005. Mike Lull has been building basses for pros like Jeff Ament of Pearl Jam, and Tom Peterson of Cheap Trick for years. These high end and master crafted basses are now available to you. Pre-owned Mike Lull M5V Natural NEAR MINT! Beautiful Pre-owned Mike Lull M5V in Natural Gloss in immaculate condition. This M5V is all original and plays like a dream. Frets are 100%, with no dings, scuffs, of superficial scratches to finish. Mike's five string version of the V4 adds a booming low 'B' string for that extra earth shattering thump! The classic non-reversed T-Bird style bass takes “the thunder" to a whole new level! The NRT4 has deep and huge tones reminiscent of that 70’s grunt we all know and love but with a twist of extra sweetness and articulation. This unique tonal difference was accomplished by Mike reverse engineering a set of 1964 T-Bird pickups while adding his own take to the design creating truly earth shattering bassaliciousness! The NRT4 and NRT5 share the same specifications as the T4 and T5, but with the vintage-style non-reversed body shape. And here’s another perk — no headstock dive! Yes the original 'Birds had headstocks that just loved to dive to the floor when hands were taken off the bass, Mike has aleviated this issue while at the same time dramatically lowering the weight making the bass’s overall ergonomics much friendlier to the player. They said a lightweight, thunderous T-Bird without an annoying neck dive couldn't be done. Mike Lull has proven them wrong in his crafting of the T-4. Full Electrostatic Shielding FREE SHIPPING! Capitalizing on a 25-year relationship, Lull and Ament worked together closely to create the signature model bass. 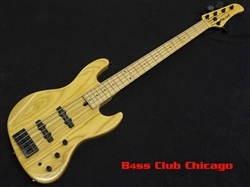 The bass features a 20% oversized body, but thinner body thickness than standard Mike Lull T4 models, along with a reverse headstock. Jeff Ament personally chose all custom colors, finish, and wood configurations. The JAXT4 comes with a chromed aluminum JA pickguard engraved with an Ament designed T-bass logo, Jeff's signature on the headstock along with a special Mike Lull logo designed by Jeff to be used only on his signature model. Included is a custom Ament hardshell case with a hand-stenciled logo on the exterior. FREE SHIPPING!